Is it bad that crazy mom du jour Amy Chua‘s children are playing at Carnegie Hall, but my heart swelled with pride watching my daughter reach across the cafe table to try a bite of my husband’s smoked salmon breakfast sandwich? And then proceeded to swoon? And then proceeded to ask for it in her lunch, which means occasionally we can send her to school with — get this! — something that is not a turkey sandwich. 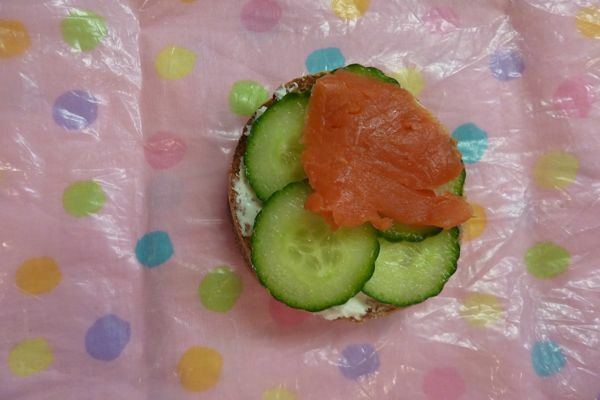 No reason this sandwich (a whole wheat English muffin topped with dill cream cheese, cucumbers, smoked salmon) can’t join the ranks of Sandwiches for Dinner either. Note to Rivertowners: The sandwich was inspired by the far superior version on artisanal rye, made by Avi at the Hastings Station Cafe. Can she keep that refrigerated enough for a school lunch? I wish people would stop referring to Chua as a bad/crazy mother. While my parents weren’t necessarily as strict as her (I could go to sleepovers, but only at next-door-neighbors’ and other Indian children’s homes), they were fairly strict and I’m happy with how I’ve turned out, as are my brothers and other friends from various other immigrant communities I’ve encountered. It’s simply a different way to raise a child; not everyone has to agree with it, and it certainly shouldn’t be labeled “crazy” when there are a lot of us that are successful products of that system who are perfectly well-adjusted individuals. On a happier note, I love this sandwich idea and cannot wait to try it – I’ve been looking for something beyond my eggs in the morning. Thanks for sharing! SV – You’re right. I am guilty of poor word choice there. But it’s hard for me to hear about a mother threatening to deprive her kid of dinner (dinner!) until she masters a Jacques Ibert French composition on the piano. And also, as always with stories like these, she does have some really interesting things to say (believing that her children are inherently strong, not fragile; knowing that kids will be more inclined to like something if they are good at it, and the only way to get good at it sometimes is to push them) but the finger-waggy tone and the assumption that all kids are going to respond to the same kinds of parenting just makes me crazy. But I hear what you are saying and I’m certainly curious to read the rest of the book since I only read the WSJ excerpt. In that way, I am guilty of the same thing that I’m accusing her of — oversimplifying the issue! Thank you for writing. And enjoy the salmon!!! I got a kick out of your Tiger mom comment; I feel the same way- my kids aren’t at Carnegie Hall, but their accomplishments are still pretty fabulous to me.